Yes It can be reversed before the Bank transfer.Once the transfer is done the pay menets need to be adjusted in the next payments. What activities are possible when the payroll control record is set to " Released for Payroll "? How does the system know when to trigger retrocative accounting for a particular employee? You have to mention the retro active accounting date in IT 0003 in the relevant feild. other wise it will take the earliesr hiring date. Yes you can go in a seperate sessions. How to create payroll area, pay scale types and levels for different employee group and subgroup? To create Payroll Area you need to go to PM-PA-Organisation Assignment - Create Payroll Area-Check Default Payroll Area To create Payscale Type and Payscale Area u need to follow : PM-PA- Payroll Data-Check Payscale type/ Check Payscale Area Payscale Levels and groups are created while doing the step Revise Payscale groups and levels and Define Salary ranges. I am facing T503 problem after assigning all personnel area, employee group, Company code, subgroups etc. May Be You had not activated Employee Attributes. Do you know in OM -> copy plan version? Would copy plan version (Tcode:RE_RHCOPL00) also copying payroll RT, PA master data, user authorizations, Abap reporting, Abap queries and etc as well? Up to my understanding it should work only copy the OM's structure and objects (solely)... However for the rest of non OM/PD objects related and other HR modules, I have doubt on it. If this can be done, please advice HOW to go with? This report is only for copying objects from one planversion to another planversion to keep updated structures. Always only one plan version would be active which is current. This report does not help to copy any masterdata. Can anybody tell abt Assignment part of HR.i.e. how sap HR is assigned with other modules. How do I design the Indian Remuneration statement for the first time as the IN01 which is copied and renamed is showing blank. What actually happens in real time Recruitment? I got struck in PB10 initial entry screen. While assigning personnel officer by default its showing the standard one like APPL's admin group only. Its now accepting what I have created under PA define admin group and I assigned under define admn group also (PINCH). Here, you control the initiation of actions when maintaining an infotype record. This can be the maintenance of an additional infotype record or performing a routine. For each action, you can determine whether it is always carried out when you change an infotype or a subtype or whether it is only carried out if you change certain fields. You can state whether the action is to be carried out for "Change", "Create" and/or "Delete" record. You can store the conditions for executing the action, for example, the comparison of the old and new value of a field. Finally, you can also specify default values for a record that is to be created. I am facing problem in PA40. While entering the inputs in Personal data in hiring action, I am having the field which is called " CUIL/ CUIT" ( Which it shows key field) . I do not know about this field and how to enter the data in this field. I would like to remove this field from personnel data. IIIly i am having one more field in Bank details in hiring action, I am having the field " Bank Key " I would like to know how to delete/ remove this field from the action, or else how to input the data in this field. I don't know how to remove this field. But I can suggest you can hide this field by using the following path. Not only this you can hide any field in your screens. Then execute details, in 011 -- Q0002-CCUIL -- Worker identification code -- activate Hide checkbox. You can use screen modifications and hide the field. after you hide it and save the settings, CCUIL will not be seen on the screen. Same procedure can be used for bank key too. for your information, the various field options are required field, optional field, hide etc. Integrate SAP HR Admin to SAP SD module. Integrate this using IT 0900 (Sales Data) so that person would be accessed in SD. 1.) How to make a wage type appear in the remuneration statement? 2.) How did you transfer legacy data in the mid of the financial year (US) to SAP system? A ) For mid year Go live SAP Supports with only transactions of HR and others but nor Finance, u should have asked the question to him, or replied by giving the INLK Schemas is used for Mid year Go Live or even a program is there for mid year go live,in the help CD, find IT. A ) Data transfer has to start from OM -- > PA ( All emp related modules as benefits,rect, training, PD,COmpn mgmt and others) --- > TM _---> Payroll. This is different from client to client and No standard is fixed to data transfer. A ) Legacy System Migration Workbench which is used for data transfer for any of the transactions which exist in SAP OR even which Customized by developers. 5.) What was your legacy system and how many digits were your personnel number are? 6) What did you do with symbolic accounts while posting payroll data to Accounting? As you know this try with se38 give any program -- > press F8 and then F5. Caution: more than one answer may be correct. Please mark ALL correct answers. 5) Is infotype 185 country specific, can it be maintained for India , and will it affect the payroll if it is maintained? 29) What is an Unsolicited Applicant Group? Unsolicited Applicant Group is a group of Applicants who have applied without any advertisement or requirement from the company. The best example is, these days, most of the job seekers, go to companys URL and and load their cv details. These details get stored as UNSOLICITED APPICANTS in the Companys Intranet. 1. What is the difference between PCR and CAP? 2. How do you run payroll? 3. How do your correct payroll? 4. If i want to include some more wage types, say bonus from today. 5. What is meant by payroll area? What are the uses of payroll area? 6. What is meant by a control record. 7. What is meant by retroactive accounting? 10. What is a counting rule? 11. What is absence type? 13. What is absence quota type? 14. What are the features you used in benefits? 15. How many health plans have you configured, what are they? 16. What are the most important ITs in benefits? 17. List the applicant actions in recruitment. 18. What is the feature used for Personnel Administrator. What group should u use in that? 20. What is an applicant group? 21. What is an unsolicited applicant group? 22. What is the t.code for authroizations? 23. Differentiate between Payroll area and payscale area. 1. Explain the uses of the simple maintenance interface? 2. What is the use of INFOGROUPS? The infotype group (commonly known as infogroup) guarantees that during the personnel action, all information needed for the business processes is stored. The infogroup is processed when you perform a personnel action. - An infogroup exists in the standard system for every personnel action type. - In Customizing for Personnel Administration, you can tailor the make-up of the various infogroups to the requirements of your company. - You can define infogroups as user-group dependent. Infogroups are used in Personnel Actions to define a set of sequencial infotypes that you would be using while performing an action. For example, when you hire, you would want to use IT0000,0001,0002,0006,0007,0008 etc in a sequence- in a particular order. So define an Infogroup for this purpose which contains all these infotypes, their order of execution and the user groups it is applicable for. Then you assign this infogroup to the action that you had defined. 3. What is PROCESSING CLASS, where we do them and why? 4. What is EVALUTION PATH, where do we do it and why? 5. What is INTERNAL PAYROLL PROCESS? What is the use of time evaluation.Where it will use exactly. wt is differenc between performance managment and online performance management in sap hr?where we can get the material in onlinemanagement? Which companies are using the SAP HR in their HR System? Please list their names? Both Indian nad Global. how to write a pcr rule for over time?and how to insert that rule in a schema? how can we lock the group of employees while running the payroll? what is the link among organizasion structure and enterprise structure, personnel structure, payscale structure? where do u configure, if an employee is not taking any half- day leave in an organization? 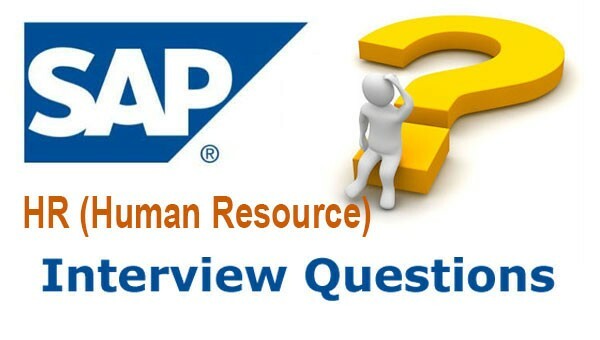 What is Landscape in SAP HR. What Is Developer Server. In Which Infotype Use in Cost Center. Discuss in detail about blue printing ...what was your role in that. Allowances are paid depending on his gradation and even wages are also paid on this criteria, if AB are paid bas, hra and DA then take three wage types ans assign to the ES Grouping and don't give HRA wage type to C.
1--How to create a time schedule for 1 day training where when the breaks, working hours does not coincide with the training time and the person is also booked . 2--How to create another time schedule that is coinciding with the training time and the person is not booked. What are the steps in time management, so that I can understand by both the scenarios why a person is booked and when he is not booked. A. No need of time management. while creating an event you will be creating time schedule in the box select user defined where you can define different timings for different days with intwervals like weeks , months for this just select multiple. Q. I need to ask you that while I am trying to book one person in training for a business event type, they are saying that this person is not available for the business event. Why is it so? But that I can book a user for the same business event type. What is the differense between user and person? Now in case if I book a person for the business event, how can I see whether that person is available for that date or not. Moreover how can I see that that person is on leave or not. Q. About time managemnet. Now I am trying to book person, but I have to see whether this person is on leave or what about the break schedule so that I can give training. For this purpose I am starting again. I am recruiting 2 person, generating 2 personnal no, then prepare the infotype about time and create 2 scenarios to see that in 1 case the person is booked for training (because time schedule is not coinciding wiith the training period) and I want to create another scenario where I can see the person cannot be booked (time period coincides with the training period of only 1 day.) What are the steps of time management about both the scenarios. Q. There is 1 person but its displaying that this person cannot be booked. He is not available for the business event. Can you tell me where is it going wrong? What can be the reasons? Create a calendar with open days means without any holidays and assign in Training and Event Management --> Basic Settings --> Controling days off --> Specify Factory Calendar in this thru drill down/check box select the calendar which you have created in time mangement without any holidays and try out if again. If it shows the same message then remove time integration. Q. I have a certain group of employees who have vacation exceptions. The company does not want to create additional PSA/PA to enable me to put them in their own PSA Grouping for time quota types. Can I use IT2012 to bring in the exception hrs and then add this value to their accrual as defined in config. Because of this they will accrue vacation time at a higher rate. Is this possible? Combining config settings and schema to accrue leave. If I could put them in their own separate PSA grouping for time quota types it would be easy for me as I would not permit generation of quota during time eval. And then do this in the schema. Any suggestions? Q. I just wanted to know that when I am recruiting some body, I am generating his personal no also. Then I want to give him a training also. Now I just want to create 2 scenarios to clear my doubts. Q. What is a BSP application? A. BSP (Business Server Pages) in the new dimension in SAP where by webapplication can be built. BSP uses HTML for the presenation and ABAP for the business logic. As an option there is also the Java flavour using JSP.BSP applications are far better than the old IAC's (Internet applicationcomponents) deliverd vide the ITS where the display format is kind of fixed.In SAP HR the new appriasal system used BSP.Well this is only basic information. You may wish to use the MBS (WASversion) to try and developed a simple application using BSP. Q. What are the difference between : Retroactive Accounting Period, Earliest Retroactive Accounting Period! A. Retroactive Acc Period: The retroactive accounting period refers either to an individual employee or to a payroll area. The earliest possible retroactive accounting period is specified for a payrollarea. The system also takes into consideration the employee's initial entrydate. Earliest Retroactive Acc'g Period: The period furthest back in the past for which it is still possible toperform a retroactive accounting run. This means that retroactive accounting takes place for a period for which payroll has already been performed. Q. Is it possible to implement hr without fico in any company? If yes, then who will create the company and other things in enterprise structure. if my company is implementing only hr without fico and in hr also only personal administration is it possible? Actually my client querieing me that whether is it possible only to maintain the employee details as he got other accounting packages like tally. For the second part of your question, YOU, the HR guy, will create minimum information in FI and maybe CO (company code, maybe cost centers). Just create an IMG project for PA HR, and the needed basic FICO activities will be included. 1. cost center and work center. 2. personnel area(WERKS) and personnel subarea. 1) Cost Center is for assigning Symbolic acounts related for Posting in GL Accounts and Work center is related to specific work area as Utilities, Boiler section, Processing section and Others you can assume. 2) Personnel Area is an exact Geographical Location under which the comp decides to run their Processing and Personnel ares are all as the Departments in an Hierarcheal Structure which are divided for TIme mgmt, Payroll as PS grouping. 3) Retrocalculating Account. --- > First it is not Retrocalculating Account and it is the payroll which is the running in this month has to carry any earliest payroll for balancing and controlling the payments for an emp for and can be used while paying any Bonus or advance.